This past Sunday the Gospel reading came to us from John. John 21:1-19. A very very interesting story. Here we have 7 of the disciples, who have gathered in Galilee, just sitting around, hanging out, probably just doing dude stuff. They find themselves by the sea of Tiberious. What are they doing? So we have 7 of the disciples doing nothing and finally Peter is like, “I am going fishing.” (Yes, that is a direct quote from the Bible. For anyone who has not gone fishing, it is truly one of the greatest ways of killing time and having a good time. Well, the other 6 disciples don’t want to be left out so naturally they say, “We will go with you.” (another quote). Now they were fishing for a long time. Like all night. This is not the fishing as we know it today. They did not simply cast their line, sit back in a comfy chair and nap until they catch something. Nope. This fishing was hard work. This style of fishing was called cast net fishing. They would take a net about 20 feet in diameter that had lead weights attached to the borders. They would then fling this whole weighted net contraption off the side of the boat, very skillfully mind you, because you have to throw it in a way that the whole net spreads out and lands flat on the water. As the net sinks, the weighted edges come together and trap the fish in the middle. Then, more often than not, someone had to jump in to catch the net and help lift it back up and into the boat. That is a lot of work! Imagine how tied you would be if you did this for an entire night! Now imagine you did that and you caught nothing! No fish. None. Zero. Zilch. Can you imagine?! 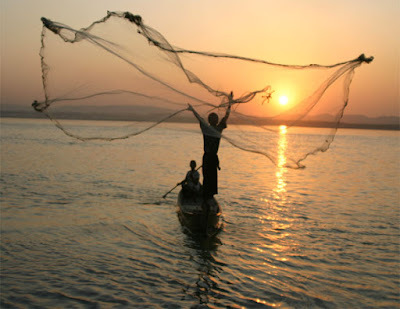 So then, at daybreak, this man is standing on the shore and tells them cast their nets on the other side of the boat. Naturally, when someone 100 yards off in distance and you’re not sure who it is, you listen to them. Good thing too, cause that was no ordinary man. It was the Risen Lord! This is the third time that Jesus appears to them! Remarkable! This is a special, very intimate conversation. If you remember, Simon Peter is his name, however, Jesus called him Peter. Peter was his nickname. If you actually go back and look at the origins of the name, it comes from the Greek Petros, which means stone. Remember when Jesus told Peter that he would the “rock” on which he built his church? Well, hence his nickname, which is pretty much like calling him “Rocky”. More than what, more than the other disciples? I don’t think that is what he was referring to. They had just returned from fishing, the job he left when he began to follow Jesus. That was his old life. That was a certain life that he grew up and understood. After the crucifixion of Jesus, what was he suppose to do? Three times he is asked…and it was three times that Peter denied him. But did you know that the Greek words for “love” that are used in the passage are two different words? When Jesus asks the first two times, “Do you love me”, he uses the word agape. A word that means unconditional love. A love that we don’t fully understand and a concept that we struggle to grasp. The third time Jesus asks, “Do you love me”, he uses the Greek word filee. Each time Jesus asks this question, the intensity grows, he use of the word “love” is stronger and stronger. In his responses Peter says “You know that I love you.” However, he is using the word fileo. Also a Greek word for love, but more of a friendship love, more of a loyalty. Each time Jesus responds. Feed my lambs. Tend my sheep. Feed my sheep. But what does that mean? That was the order given. Many people interpret these in different ways. Some claim this a call of the importance of youth. Lambs are young sheep. Feed my lambs. The first thing we are to do is to look to the young. Many call Jesus one of the first youth ministers. He hung out with and preached a lot about youth. And he, he calls us to feed his lambs. Tend his sheep. Feed his sheep. He ends with this invitation. An invitation that is still offered to us today. An invitation we may still struggle with accepting. But no matter what, it’s there.